Select your plan. Get full access. Try it free for 30 days. Cancel anytime! "Even if you’re a great stock picker, it never hurts to get a second opinion before you pull the trigger. Super Stock Screener appears to be a good resource for getting a second opinion, and potentially much more." After choosing your plan, you'll be asked to enter the email and password you want to use with your account. Once this is done, you'll be redirected to a page on which you'll have to enter your financial information (can be a PayPal account). 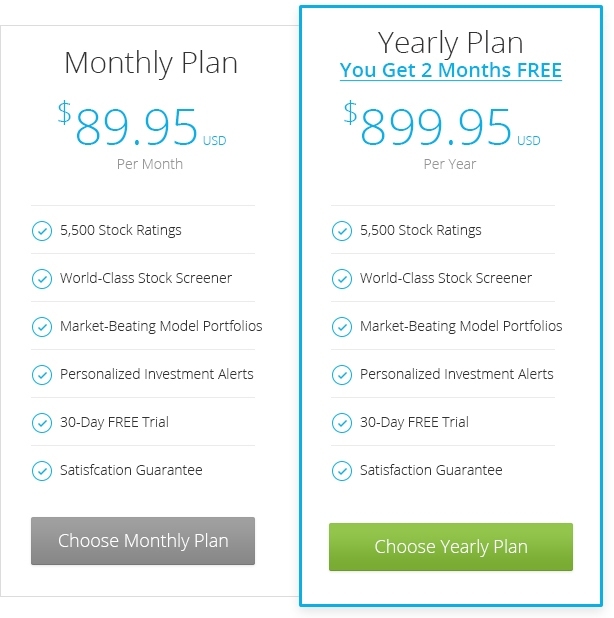 The price shown on this page is the price you'll PAY AFTER THE 30-DAY TRIAL. There is no charge to try the service for the first 30 days of your subscription, and you can cancel at anytime! "I have been following the Super Stock Screener portfolio [...] and had been extremely impressed with the accuracy and timing of each trades. I want to thank Super Stock Screener for making trading simple."